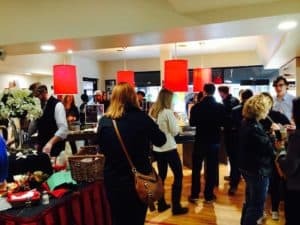 After enjoying a few balmy weeks of pre-spring temperatures, the only saving grace of waking up to 30 degrees and the occasional falling snowflake this past Saturday was knowing it was the perfect weather for the 5th annual Sewickley Soup Crawl. We were one of 18 businesses along Beaver Street who participated, each of us being matched with 18 local eateries that provided the soup. Our ladles came courtesy of Pizza Roma, who had whipped up a huge batch of Sausage Pastina for us to dole out. Just how large is a huge batch? Well, we were barely an hour and a half into the event and had already gone through 15 gallons of soup. That didn’t surprise us – last year, we completely ran out! So while customers arrived for their normally scheduled appointments, perusing our inventory on a quest to find the perfect pair of glasses, volunteers dished out enough soup to satisfy the palates of 600 hungry ticket holders. You should have seen the sidewalks – they were absolutely jammed-packed. The event was produced by Explore Sewickley, a 501c(3) nonprofit dedicated to helping the Village of Sewickley thrive. 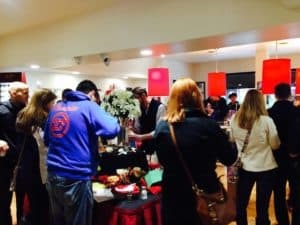 The Soup Crawl is one of a few they do throughout the year, which in the past has included Wine Crawls and Beer Crawls, too. Soup is always the biggest draw, though – they sold 150 more tickets than last year. We had a great time and really enjoyed meeting everyone who came through the door. “Sewickley’s such a small, close-knit neighborhood. We always participate and show our support of what they are doing. And it’s also a lot of fun,” added our retail director, Adam Speece.